The excitement of school cricket will reach its climax when the country’s top schoolboy cricketers will be rewarded for their efforts after a strenuous 2018-19 season. That’s when the 41st Observer-Mobitel Schoolboy Cricketer of the Year gala awards night will be held at a posh venue in Colombo shortly. School cricket’s premier and the first inter-school awards show will be sponsored by the country’s national mobile communication provider SLT Mobitel, under its dynamic CEO Nalin Perera. Former Sri Lanka cricketer Naweed Nawaz, who won the Observer Schoolboy Cricketer of the Year mega title in 1993, was the first and only cricketer from D.S. Senanayake College to achieve that honour. The 41st Observer-Mobitel Schoolboy Cricketer of the Year contest’s most popular segment is in its final stages with heavy voting for the leading contestants. When the resounding success story of the Observer-Mobitel Schoolboy Cricketer of the Year is talked about, one cannot forget the humble beginnings it had. Former Sri Lanka batsman and present Ananda College coach Sanjeeva Ranatunga said that everyone must keep in mind that it’s not winning or losing that matters but how one played the game. The Observer-Mobitel Schoolboy Cricketer of Year contest has picked some of the top cricketers over its four decades of rich history and existence. Ranjan Madugalle is the proud first ever winner of this prestigious award in 1978/ 1979 when he was captaining Royal College. Since then, it took eight years to pick another distinguished schoolboy cricketer from the Reid Avenue school. 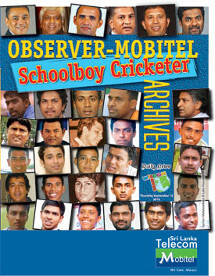 The Observer-Mobitel Schoolboy Cricketer of the Year has always been the prime target of many schoolboy cricketers. Winning such a mega event would definitely change the destiny of a deserving personality. This year’s Observer-Mobitel Schoolboy Cricketer of the Year is going great guns with the all-important first team matches reaching its peak with the annual big matches also being played. Muttiah Muralitharan needs no introduction. He is the world’s highest wicket taker in Test cricket. Apart from that unique feat, there are several other world records in Muralithran’s cupboard in a legendary career as an exemplary Sri Lanka cricketer. He first came to the limelight through the Observer Schoolboy Cricketer contest some 28 years ago. A highly successful bowler in school cricket at that time, Murali was adjudged Observer Schoolboy Cricketer in 1991 when he was playing for St. Anthony’s College, Katugastota.